My family has always been crackers over Cream Crackers and we treat them like toast, slathered with strange and various toppings. The origins of this version go way back to the 1930s when my grand-aunt, Ini, was a young child. Apparently, there was this one time when the large and extended family had all gone on a day long picnic. In those days, restaurants didn’t quite exist and food was either taken along or cooked on the spot. The custom in my grandaunt’s family was to take the family cook or ‘khansama’ along so that they could all enjoy some hot food, alfresco. Fresh air and the outdoors bring on the hunger pangs rather quickly – after all, the whole point of a picnic is the food! Now, the cook didn’t relish being checked on every half an hour by a gang of hungry kids. So he served them mince on crackers to keep the little mouths busy and the tummies full enough to stop them from annoying him while lunch was cooking. I remember eating this while we were waiting for many a late Sunday lunch to be brought to the table. Clearly, my grandaunt had learnt the secret to calming rumbling bellies while lunch was still on the hob. The days of cooking a picnic alfresco may have long passed, but kheema on mince is here to stay, at least in our family. Do you have fond memories of a favourite childhood snack? Add the ginger, garlic, turmeric, paprika, PP sambhar powder (or garam masala powder) to the mince. Add yoghurt and mix well. Keep aside for about 30 minutes. In the meanwhile, heat the oil or ghee. When it is hot, add the chilli and let it splutter. Add the onions and fry well. When they start to brown, add the tomatoes. Cook this well until you have a thick mixture. Add the peas and cook for another 3-4 minutes. Now add the marinaded mince along with the tomato paste. Mix well and add salt to taste. Add water, cover and cook till mince is done. Uncover and add the mint and coriander. Cook uncovered for 3-4 minutes till the water evaporates. When it is done, take the mince off the heat and let it cool. Lay out your crackers on a serving platter and spoon some mince onto them. I have used chicken mince but you can use lamb mince, if you prefer. 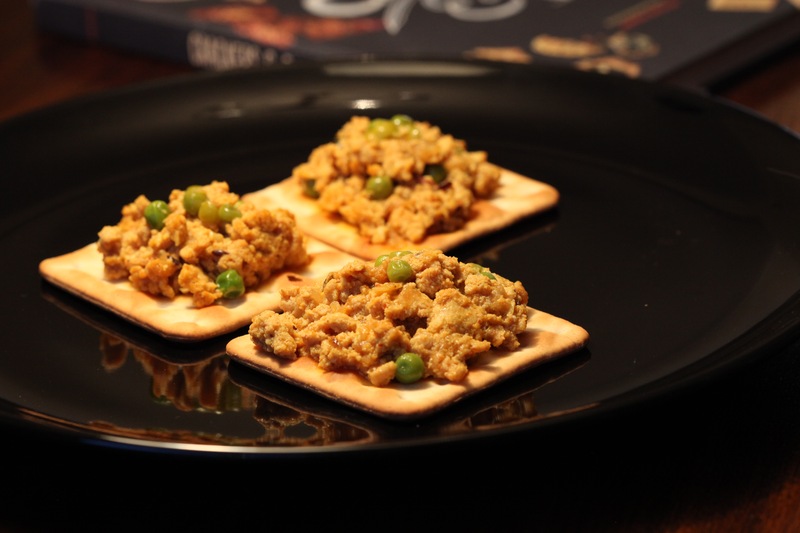 This entry was posted in A-Z 2016, Fish and Meat, Meat and Poultry, Savoury snacks, Teatime snacks or Brunch ideas and tagged #AtoZchallenge, cream crackers, elevenses, epicurious, kheema, kheema on crackers, mince, mince on crackers, Mumsnet Blogging Network, Yummly. Bookmark the permalink. Thanks, Rajlakshmi. It’s my favourite way to eat crackers.